One of the perks of my moonlight gig as one of the nation's foremast amateur-hack foodie reviewers of all-things-Trader-Joe's is getting to hear from friends, family and colleagues about whatever they've tried from TJ's. I get some of my best tips this way. In particular, I love hearing from recent Trader Joe's converts too - heck, anything they can get excited about, I figure it's worthwhile. The store hooked me with fake meat, of all things, so I'm willing to try most anything that gets a newbie's heartstrings. 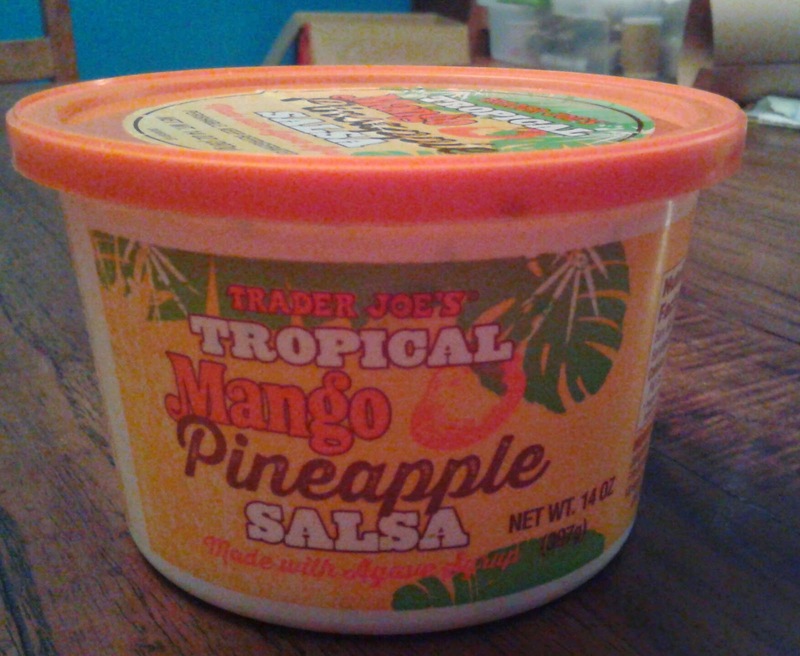 Except...Trader Joe's Tropical Mango Pineapple Salsa. Chrissy, one of my supervisors at my real job, came up to me a few weeks back after visiting the new North Hills Pittsburgh TJ's all worked up about this particular dip. Unlike almost anything else she says (promise, Chrissy! ), I kinda let this go in one ear, bounce off something hard, and go back out. I have theories for this: Was still working on the first cup of coffee. 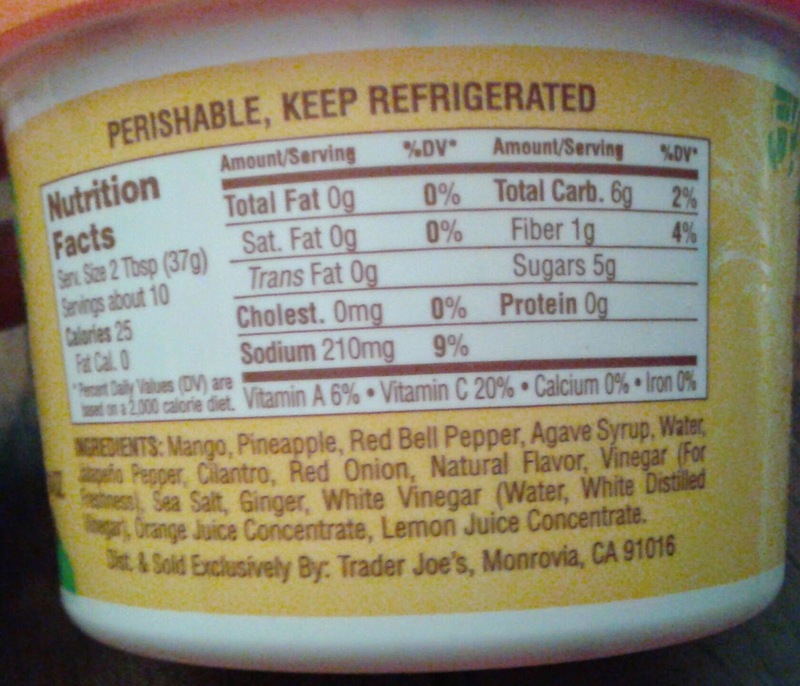 Heard "mango pineapple" which somehow translated to "peach" in my head (not a fan of the TJ's brand). Not a fan of fruity salsas in general anyways. Like my usual go-to too much to deviate too far off course. Had to get those TPS reports done before taking the printer out to the field with a baseball bat. You know how it is. Alas, it ended up in my cart the other day anyways, courtesy of the wife. No tomatoes equals a winner in her book right off the bat, and she wanted a little "something different" to go with some chips, veggies, and sausages for dinner. Fine, I said. Sigh. Fine. Listen, I'm not gonna say this is the best salsa I've ever had. But, coming from a guy who doesn't like fruity salsa, this stuff is freaking delish. Fo' reals. It's thick and chunky but soft and plenty goopy from the agave syrup base, which had me apprehensive at first. I mean, that's a lot of fruit to begin with, and add in a sugary base? I thought it'd taste like candy salsa. Nawww. There's plenty to balance out all the sweetness - good bite from cilantro, some onion pungency, good jalapeno spice - that it all works out really well. There's a lot of the sweet upfront but plenty of spice with hangtime, if you know what I mean. Still, it seems to me that the agave syrup was a bit much, but that being said, I can't offer a viable alternative at the moment. There's just a smidge too much sugar in there that coats everything, but the rest is so good, and so fresh tasting, that I can't mount too much complaint. You'll find this for $2.99 in the refrigerated section, not with the jarred variety, and tastes like it'll be a constant companion for summery snacking. Chrissy, the boss lady, loves this stuff enough to give it a five, with only the small caveat she wished there was a little less onion but everything else was "perfectly balanced." My other boss lady, I mean my wife, states more or less the same giving it a four. My score would nestle itself somewhere in there as well, so with some fuzzy math, we're gonna call it almost Pantheon worthy. 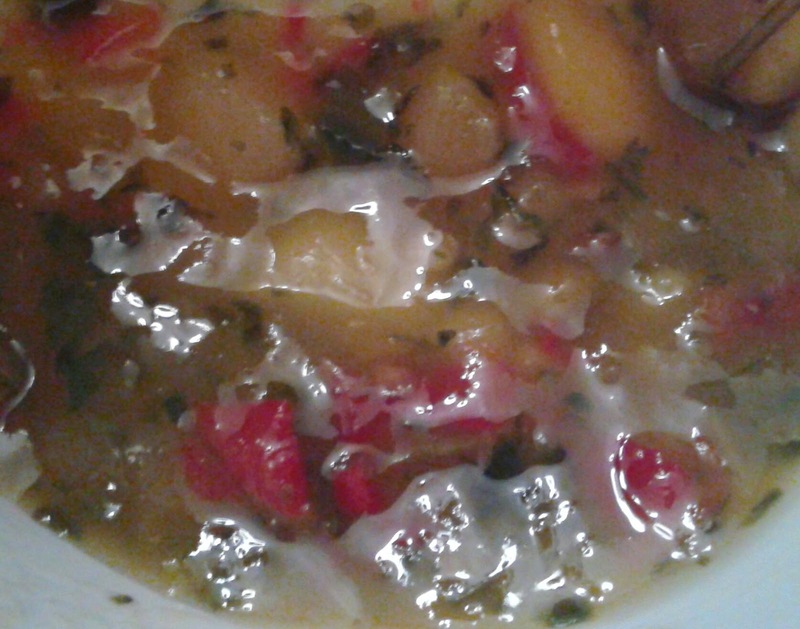 Mango salsa is really easy to make but I will keep this in mind if I am in a rush. Thank you. Also, have you tried the red pepper eggplant sauce yet? Great on TJ pizza dough instead of pizza sauce. A 9? Wow. I cannot stand sweet salsas....but seeing how you share my aversion, I'll trust your opinion and give it a go. Are you planning to review the PB&J yogurt? This might be good on grilled fish. I love tomatoes but have to limit them or I'll start reacting (lovely allergies). Fortunately, my favorite tomato sandwich (big slices of tomato, egg-free mayonnaise, bread, and salt) can be made substituting with cucumber or colorful bell peppers... There are loads of "tomato free" pasta sauce recipes now on the web, by the way. A lot of people are sensitive to nightshades in general. I actually made a tomato-free pasta sauce ages ago pre-Internet from an allergy cookbook, using beets, rhubarb, and pumpkin. Sounds odd but worked. There are other combos as well. Soy chorizo makes a wonderful substitute for tomato sauce on pasta also. You also don't need tomatoes for pizza, you can even ask them to not add the tomato sauce at a pizza joint.